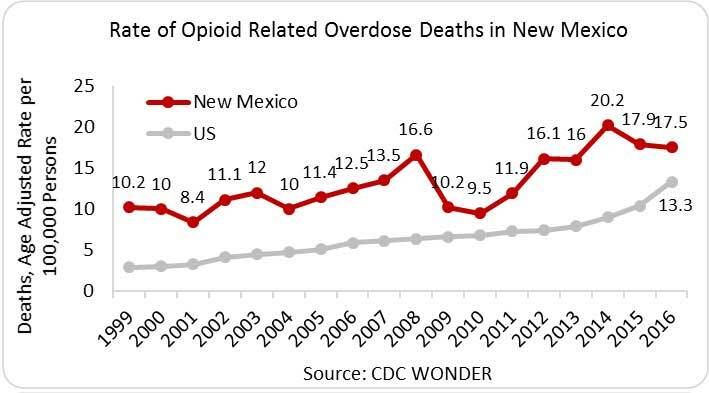 In 2016, there were 349 opioid-related overdose deaths­­­ in New Mexico—a rate of 17.5 deaths per 100,000 persons—compared to the national rate of 13.3 deaths per 100,000. 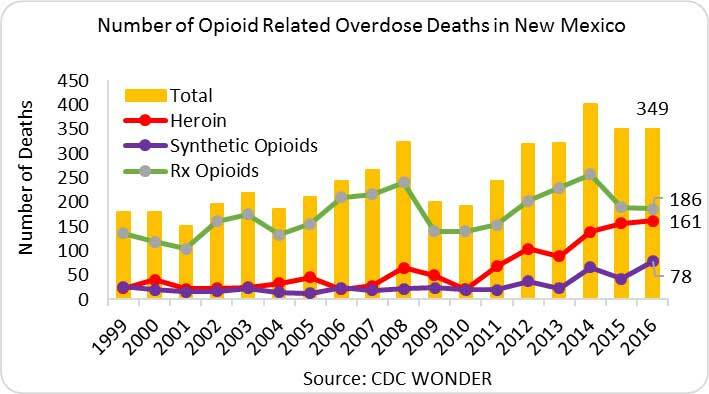 Since 2012, the number of opioid overdose deaths attributed to heroin increased from 104 to 161 deaths and deaths attributed to synthetic opioids rose from 37 to 78. Prescription Opioids increased through 2014, but since then have decreased from 257 to 186 deaths. 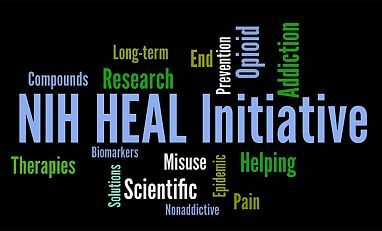 In 2015, New Mexico providers wrote 70 opioid prescriptions per 100 persons (approximately 1.4 million prescriptions)—equivalent to the average national rate of 70 prescriptions per 100 persons (IMS Health, 2016). The incidence of NAS in New Mexico has increased from 3.7 cases per 1,000 births in 2009 to 8.5 cases per 1,000 in 2013. The average across the 28 states included in the 2013 analysis was 6.0 per 1,000 births (CDC, MMWR, 2014). State Incidence: Of the new HIV cases in 2015, 135 occurred in New Mexico, with 13.5 percent1 of new cases in males and 12.5 percent of new cases in females attributed to IDU (AIDSVu). State Prevalence: In 2014, an estimated 3,096 persons were living with a diagnosed HIV infection in New Mexico—a rate of 180 cases per 100,000 persons. Of these, 18.8 percent1 of males and 26.1 percent of females were living with HIV attributed to IDU (AIDSVu). State Incidence: In 2015, New Mexico reported 3,680 cases of chronic HCV and 40 cases of acute HCV (1.9 cases per 100,000 persons) (CDC). State Prevalence: An estimated 28,000 to 67,500 persons are living with HCV, including up to 45,000 living with chronic HCV (New Mexico Hepatitis C Coalition).